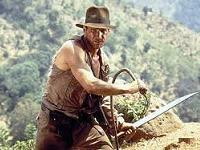 On its release in 1984, Indiana Jones and the Temple of Doom caused quite a fuss. The film's grisly depiction of violence and ritualistic sacrifice within an ostensibly family friendly framework led to the creation of America's PG-13 certificate, and drew heavy criticism. It was especially shocking when one considered that its classic, light-hearted progenitor was Raiders of the Lost Ark, the iconic adventure that introduced us to the famed hero Indiana Jones. Decades later, it's much easier to accept Temple of Doom for what it is: a frenetic roller-coaster ride directed with typical gusto by Steven Spielberg, although the prevailing undercurrent of nastiness means it's far from the best Indy film. The storyline this time sends Harrison Ford's hero off to the depths of India, in search of a sacred stone that has been stolen from a village by the evil Thuggee cult. Accompanied by Asian kid Short Round (Ke Huy Quan) and nightclub singer Willie Scott (Kate Capshaw), Jones realises that he must retrieve the stone and save the village's children, all of whom have been kidnapped by the cult. Also returning to the franchise was John Williams, at the tail end of what might be defined as his 'Golden Period' (Jaws, the Star Wars trilogy, Superman, ET et al). Raiders of the Lost Ark of course introduced the world to one of the most famous adventure themes of all time, the Raiders March, one which gloriously revived the sound of Erich Wolfgang Korngold and cast Ford as a new matinee idol for the ages. However, one aspect of the Raiders score that is frequently overlooked is its haunting undercurrent of spirituality, tones which represent the mythical Ark of the Covenant at the heart of the story. It's one of many strong ideas at work in the Raiders score but when it came to Temple of Doom, Williams had to alter his approach. Because the story is largely set in India, and is devoid of the Christian overtones of Raiders, Williams instead compensated by amping up the energy level of the score and introducing a dizzying array of new themes, all the while staying loyal to the Raiders March. This latter point is crucial: the March is the tentpole which holds up everything else in the score. The results are staggeringly complex, even by Williams' normal standards. Things kick off with Capshaw's rendition of the Cole Porter classic Anything Goes in Cantonese – given a rousing, Busby Berkeley rendition in the film's striking opening sequence (it's also deceptively whimsical). Williams' familiar voice then takes over in "Indy Negotiates", with a great deal of nervous, snaky strings representing the verbal tussle between our hero and the Chinese gangsters at the start of the film. It's a dark, pensive start to the score but then it all erupts in the terrific "Nightclub Brawl", a ferociously exciting action piece that flies around the orchestra as rapidly as the characters do on-screen. There's a special intricacy to the action music in Temple of Doom, with rhythmic cells and components of the orchestra playing off each other in massively complex fashion. "Fast Streets of Shanghai" introduces the whimsical little theme for Short Round before finally lifting off with the first proper reprisal of the Raiders March at the end. "Map/Out of Fuel" continues the grandiose statements of the March and also teases out the first romantic strains of Willie's Theme, a slightly giddier, more tongue in cheek piece than that for Marion in Raiders. Things end on a shadowy note before the next extraordinary action piece takes over in "Slalom on Mt. Humol", the whirling strings and tambourine going full bore whilst fragments of the Raiders March, Short Round's theme and Willie's theme make dynamic appearances. From here, Williams brings Indian instrumentation to the fore to represent the new location the characters find themselves in. "Short Round's Theme" gets a full blown adventurous arrangement as they set off on their adventure to find the sacred stone; it's remarkable how Williams applies individual themes to the needs of each scene, although it's an approach he's moved away from in recent years. "The Scroll/To Pankot Palace" introduces a note of genuine darkness as our heroes close in on the location that might hold the key to the mystery; clattering percussion eventually gives way to a wonderfully portentous brass theme for the Palace itself, which will later act as the primary identity for the film's villains. "Nocturnal Activities" is a delightfully romantic piece as Willie's theme gets a full-blown airing before dissolving into a mass of plucked strings (brilliantly reflecting the spiky, flirtatious banter between Indy and the love interest). All of a sudden, shrill, strangulated strings and woodwinds leap out at the listener as Indy is attacked by an assassin – it's indicative of the more violent material that prevails throughout the score's second half. "Bug Tunnel/Death Trap" continues in like-minded fashion with frantically aggressive strings and brass raising the tension brilliantly. The blast of the Raiders March at the climax again gives the music that vital sense of structure and backbone. "Approaching the Stones" introduces a note of stunning choral ecstasy before introducing the first tragic hints of the Slave Children's March that becomes more prominent in "Children in Chains". Then there is the "Temple of Doom" theme itself: a chilling and disturbing choral chant that builds to a pounding, frenzied climax during the film's controversial sacrifice scene. The theme is actually used as diegetic source music within the scene itself, further emphasising the close relationship between image and music in Spielberg's films. There's little else like it in the rest of Williams' oeuvre, and it's thrilling to hear him venture so closely into horror territory. "Short Round Escapes" brings back a note of thrilling adventure which lasts pretty much to the end of the score. Following the heroic statements of the sidekick theme and the Raiders March, both in the former and in "Rescuing Willie" (a piece which again introduces thrilling percussive effects), the children's theme then gets its classic airing in "Slave Children's Crusade". A defiantly triumphant statement in the face of villainy, it's become a staple in Williams' concert arrangements, and is one of his most famous secondary themes. "Short Round Helps" builds on the frantic action material with rousing statements of the Raiders March and Short Round's theme amid an onslaught of aggressive orchestral writing. The score's action masterpiece then unfolds in "Mine Car Chase", Williams' music reaching insanely complex heights with woodwind and xylophone runs that are quite mind-blowing. The composer's ability to mirror the frenetic on-screen action is a tremendous accomplishment and the listener often struggles to keep up, such is the intricacy of the music. His action pieces are always something but this track is something else entirely. "Water!" restores a sense of light-hearted fun before a bit of musical in-jokery makes an appearance in "The Sword Trick", riffing on "The Basket Game" from Raiders (although Temple of Doom is actually set before that film!) The final showdown then gets underway in "The Broken Bridge/British Relief", as the urgent brass and strings pile on top of each other in thrilling fashion. There's even time for another brief rendition of the terrifying Temple sacrifice theme and the Pankot Palace theme before the enormous choral finish as Indy triumphs over evil. The little brass ditty for the British relief that closes the track is the icing on the cake. And what better way to round off this embarrassment of riches than with a classic "End Credits" suite, wrapping up Short Round's Theme, Willie's Theme, the Slave Children's March and of course the Raiders March in a spectacularly exciting finish. It's yet another highlight in a score crammed full of them. Tackling Indiana Jones and the Temple of Doom in review form is an intimidating prospect as it's simply one of the most complex, energetic works in Williams' canon. Until recently it was also somewhat overlooked as it had a negligible CD release outside of Germany and Japan. 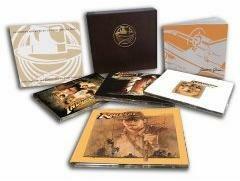 That was rectified in 2008 with the release of the Indiana Jones soundtracks box set, the first CD set to present a comprehensive presentation of this magnificent score in all its glory. 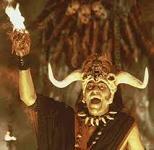 Temple of Doom really is a magnificent work, and makes one realise why Williams is as revered as he is. Every track is invested with ideas and nuances that put most other scores to shame but it's always anchored by the Raiders March, so we never doubt that this is anything other than an Indiana Jones score. It also carries a somewhat nostalgic edge, as Williams' style now favours a plethora of ideas rather than identifiable bridging themes. Admittedly the score is exhausting to listen to in one sitting, packing so much action and variety into 70 minutes that listening to it is almost as tiring as watching the film itself. 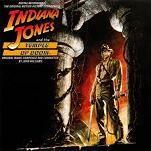 Williams had to work hard to differentiate Temple of Doom's score from that of Raiders and he succeeded with aplomb. Although it lacks the spiritual overtones of Raiders, the warm personality of the Last Crusade and the streamlined enjoyment of Crystal Skull, it's a fantastic score that deserves wider recognition alongside its more famous peers.